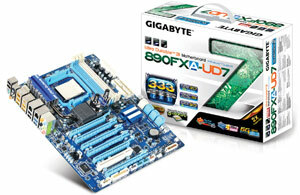 Today we bring you Gigabyte's latest offering for the enthusiast AMD crowd; the top of the range GA-890FXA-UD7. The GA-890FXA-UD7 is a feature-rich motherboard that packs everything from the latest 6-core AMD processor support to USB 3.0, SATA 6Gb/s and true support for up to four graphics cards in CrossfireX. This motherboard is based the latest Leo platform encompassing the 890FX Northbridge and SB850 Southbridge. 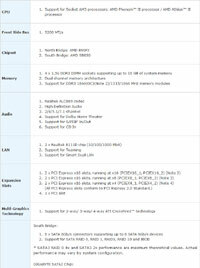 In comparison to the previous Dragon platform (790FX and SB750) the specifications are almost identical, except the SB850 Southbridge boasts native support for up to six SATA 3.0 6GB/s drives without the need for a third-party controller to be implemented. The changes in the chipset are minimal, but Gigabyte have packed an extensive range of features onto this motherboard. Exploring those will be the main focus of this review. In the box we find four SATA cables (two with L shaped connectors), an IDE ribbon cable for up to two devices, two longer than standard Crossfire bridges and a PCI slot bracket that allows for further eSATA connections and a external Molex power connector. 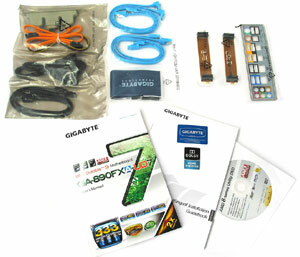 Two eSATA and a Molex to dual SATA power cable are included for use with external devices. In addition, the GA-890FXA-UD7 includes a Silent-Pipe 2 cooling solution (pictured below) that can be attached to the Northbridge to help in dissipating any extra heat when overclocking - more on that later.